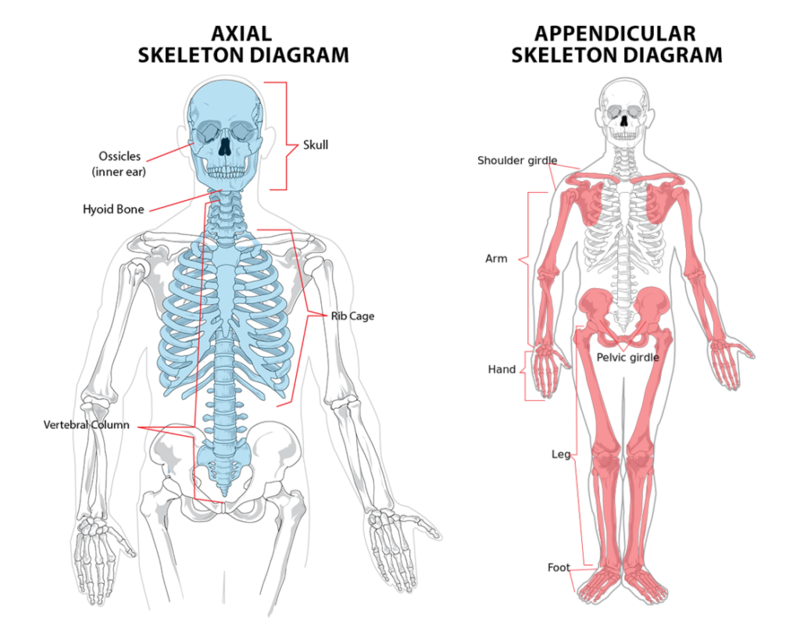 The Human Skeleton can be divided up into two parts, the axial Skeleton, and the appendicular skeleton. The central part of the body contains the axial skeleton, and the bones lying along a central axis of the body are the appendicular skeleton. The axial skeleton contains 80 bones. 29 bones in the head - 8 cranial, 14 facial bones and 6 auditory ossicles and the Hyoid Bone. People are born with separate plates which succeeding fuse to provide flexibility as the skull passes within the pelvis and birth canal throughout the birth. Throughout development, the eight separate plates of the immature bones join collectively into one single structure identified as the Skull. The mandible, only bone that remains separate from the rest of the skull. The rib cage is comprised of 12 pairs of ribs and the sternum. The rib cage protects the vital organs such as the heart and lungs. The ribs are crescents like shaped, among one end is flattened and the opposite end is rounded. The rounded ends of the ribs are joints to the thoracic vertebrae and the flattened ends come together at the sternum. The uppermost seven pairs of ribs join to the sternum with costal cartilage and are recognized as “true ribs.” The 8th to 10th ribs have non-costal cartilage which attaches them to the ribs above. The last two ribs are described “floating ribs” because they do not connect to the sternum or to other ribs. The length of each rib extends from number one to seven and then declines pair number 12. The first rib of the thoracic cage is the shortest, widest, flattest, and most curved. At birth, the majority have 32-34 separate vertebrae. Nevertheless, throughout normal development several vertebrae join together, transmitting a total of 24. The sacrum, made from 5 fused vertebrae and the coccyx, made from 3-5 fused vertebrae. If the coccyx and sacrum each as one vertebra, then there are will be 26 vertebrae. If the fused vertebrae all are numbered separately, then the whole number of vertebrae becomes to between 32 and 34. The vertebral column consists of 5 parts. The cervical vertebrae (7), thoracic (12), lumbar (5), sacral (4–5) and the coccygeal vertebrae (3–4).